Also, because the government has been buoyed by continuing resolutions since the fall, states haven’t received all of the funding that was scheduled for them in the appropriations process. Those ODOT projects that were already under contract are clipping along as scheduled, but agency spokeswoman Terri Angier said upcoming projects face delays. The shutdown began Dec. 22, and is now the longest in the nation’s history. It was triggered after Democrats refused to agree to a $5.7 billion funding package to pay for a wall along the U.S.-Mexico border that President Donald Trump promised supporters during his presidential campaign. 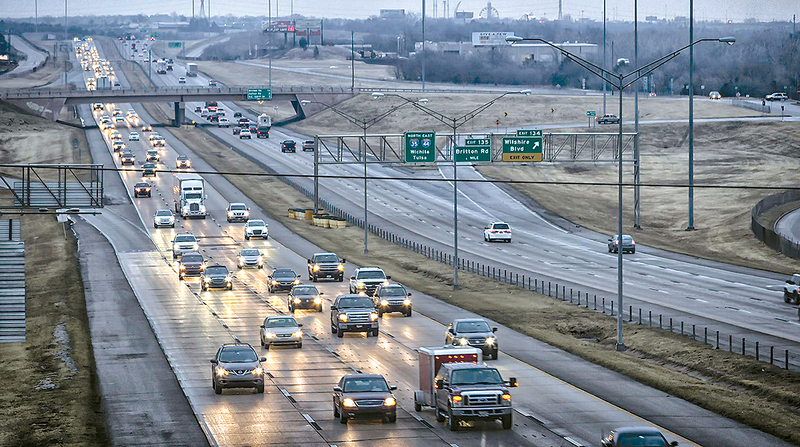 ODOT had $180 million planned for project letting in January. Of that total, some $102 million in projects involving federal funds were delayed. For February $108 million was dedicated but about $36 million is being delayed. The projects that involve federal funding include highways, county roads and city streets. Some of the projects that are being delayed this month and February involve significant freight corridors. One example is a $9 million ramp reconstruction on Interstate 35 in McClain County, just south of Oklahoma City, which runs north to south through the state. The project was meant to reconfigure the ramps to help vehicles, especially trucks, accelerate and decelerate more smoothly. Angier said Oklahoma’s position in the country makes it an important conduit for traffic moving north from Texas and east to west from Washington to Los Angeles. Angier explained that January and February are important letting months for ODOT because they set the stage for projects that occur during the temperate weather of the spring and summer. Project letting involves environmental considerations as well. ODOT workers navigate projects around the nesting season of the cliff swallow, a federally protected species that builds nests out of mud on surfaces like cliff faces and the undersides of bridges. If a certain bridge project is not awarded in February and under contract by March, workers risk interfering with the birds’ nesting season.